FOLLOW THIS HANDY GUIDE TO COOKING YOUR TURKEY TO ACHIEVE PERFECT RESULTS THIS CHRISTMAS! 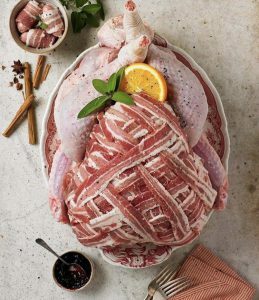 THEN DO LET THE BIRD REST FOR AT LEAST HALF AN HOUR – TO AN HOUR AND A HALF, ON THE KITCHEN SIDE, COVERED IN FOIL AND A CLEAN TEA TOWEL. THIS GIVES YOU PLENTY OF TIME TO PREP THE GRAVY AND FINISH THE VEGETABLES!